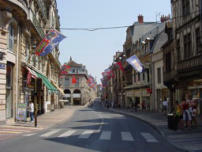 Dijon in central France is a well-known tourist spot, so you should expect it to be over-run with the tourist, especially during the day, though it is busy in the evenings too. Dijon does appeal to the Germans quite a bit. 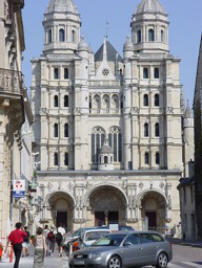 There's lots of old and wobbly here, wonderful churches and cathedrals, small and big shops and a famous gallery or two. 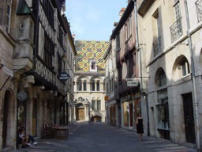 What Dijon really lacks is a river. There are lakes and pools of water, but no canals or rivers in the centre, which gives the city a slightly claustrophobic feel. Everywhere is within walking distance, including the station. 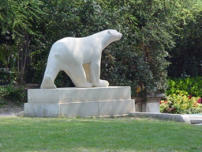 The first stop on any trip to Dijon has to be Pompon's bear statue in the park. Perfectly position by the entrance, the bear has a typical snooty bear expression that says, "welcome to my park, but don't make any noise or mess". Always a favourite. 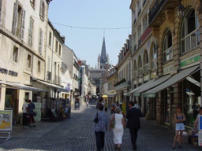 When we visited Dijon recently (summer 2003) there was a water shortage due to lack of rainfall. The many fountains were turned off, the grass looked brown and the many flowers looked a little wilty and sad, but this is unusual. 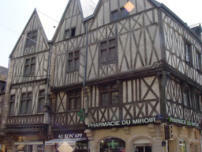 We stayed at the Hotel Philippe D'Or. The hotel itself is relatively basic and small, but is noted for its wonderful restaurant. 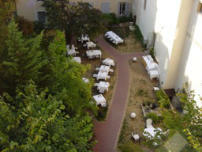 In the summer you can sit in the garden and enjoy a magnificent meal with local wine for very reasonable prices. Service is OK but could be better. There are so many good places to eat in this city the we couldn't list them all, so we won't list any more. Start with a kir, which is made in a very special way and is unlike any other appetizer you are likely to have. The Musée des Beaux Arts is world famous but has a strange collection. Beware that the modern gallery is closed at lunchtime, and the best room to visit is the Pompon room which is hidden away at the back and at the top. Still, it is easy to get round and some of the rooms are magnificent. 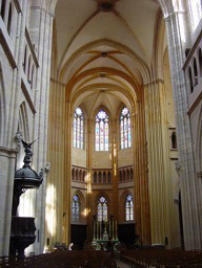 There are many churches and cathedrals to visit, some looking very smart as the restoration programme continues. Dijon children seem to be in a class of their own. They are always very serious, wear hats and give constant commentaries to their parents about the world. Of course, they are well-behaved. The merry-go-round is very popular - the children go round, and the parents sit on seats and drink whatever and watch the children go by for hours at a time.